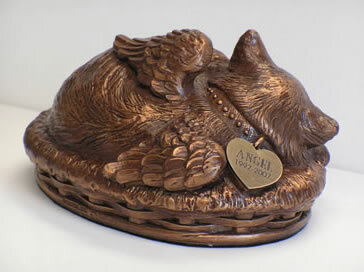 Our Copper/Bronze Angel Winged Kitty Urn is made of a metal alloy with a copper/bronze finish and depicts a sweet cat sleeping cozily in a basket. This sculture is intricately detailed. Optional engraving is available on a heart shaped tag which can be applied to the cat's collar. Please limit name to no more than 10 letters and dates to years only.